Ramanagara as we know it today would probably never have the same appeal if Sholay was not shot there. The film was iconic and the iconic status rubbed off on Ramanagaraor Ramgarh as it is known in the film. Sholay was not, however, the first film that showcased the earthy appeal of the area. David Lean’s film, “A Passage to India” put the rough-hewn boulders in the limelight with small door-like grottoes to make them look like caves. Whether being in a legendary movie’s shooting locale appeals to you or not, there is a lot more that the picturesque locale has to offer. The hilly landscape and the wide open spaces of relatively untouched nature makes Ramanagara a beautiful escape from the hustle and bustle of the concrete jungle we live in. Yatirajagiri, Shivaramagiri, Somagiri, Revannasiddeshwara Betta, Krishnagiri, Sidilakallu Betta and Jalasiddeshawara Betta are the seven major hills in Ramanagara. Several local tour companies offer day treks and hikes to these hills. Camping is also a viable option for those adventurous enough to try it. Known as the silk city in Karnataka, the local economy depends heavily on sericulture. The variety of silk reared in and around the area has stood the test of time and quality across global standards. The availability of such fine silk has spurned the establishment of several large scale and cottage weaving industries in and around the area. Small scale industries often sell very good quality raw silk skeins and silk products. Shopping in Ramanagara is another good reason to visit. Located just 50 kilometers outside of Bangalore, Ramanagara or Ramanagaram is variously known as Ramgarh, silk city, the land of the seven hills and Closepet. The area is still known as Closepet in the geological arena. The name Closepet is in honor of Sir Barry Close, an army general in the East India Company. Ramanagara is home to some of the world’s oldest deposits of granite and other rock outcrops. With such coveted granite outcrops strewn around in plain sight, quarrying was but a natural consequence. Conservation efforts have however slowed down the destruction of the hilly outcrops considerably. Apart from quarrying, plans to carve statues into the sides of the rock faces have threatened the natural beauty of the area. 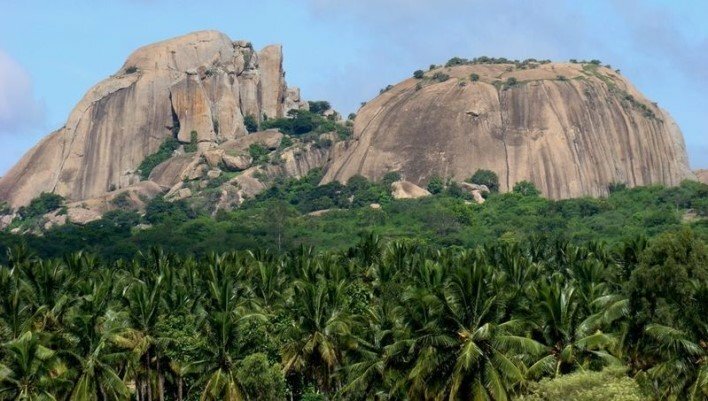 Rock climbing in Ramanagara: Some of the earliest rock climbing efforts in South India were concentrated around this area. The compact hills and seemingly vertical rock faces make for great technical climbs. With bolts put in by local climbers, climbing should not be too challenging. The older bolts however seem to have loosened over time and one should be aware of the technical difficulties of attempting such a climb. Free climbing is not a very real possibility simply because of the compact nature of most the rock faces in the area. Bird watching: For the nature buffs, Ramanagara is a fantastic weekend destination. Yellow-throated bulbuls and long billed vultures call this area home. The hilly outcrops is one of very few destinations in South India where long billed vultures nest. With these birds on the very verge of extinction, the government has declared 346.14 hectares to be Ramadevarabetta Vulture Sanctuary in an effort to protect and save the long billed vultures and their natural habitats from complete extinction. Other than the beautiful birds, nature and animal lovers can spot sloth bears and bears on short hikes or treks through the hills. Janapada Loka: Located on the Bangalore- Mysore highway, Janapada Loka is a famous tourist stop-over destination. There is an open air theater folk music and plays make regular appearances. Janapada Loka in essence is one of very few places where one can connect to what was at one point in time popular culture. There is an in house museum and an art gallery. Kanva Reservoir: Located halfway between Ramanagara and Channapatna, the reservoir is named after Sage Kanva who was believed to reside in the area during the Ramayana era. The reservoir was built across river Kanva in the year 1946. It is an ideal spot for camping with good fishing spots and bird watching outposts. Even if you are just passing through, this may be an ideal pit stop for the city weary traveler looking for a spot of peace and tranquility. Channapatna: Another famous stop on the Mysore Bangalore highway, Channapatna offers sumptuous local snacks and a shopping pit stop for travelers on the highway. The area is very well known for their wooden toys and wooden artefacts. The lacquer ware has a distinctive color palette with vivid hues and tones. The appeal of supporting several cottage industries is another reason to shop in Channapatna rather than in big stores in the bigger cities. Mekedaatu: Mekedaatu has been a famous picnic spot for travelers with lush greenery and the sangam or merging of two rivers, Arkavathi and Kaveri located very close by. Located within the limits of the Muggur forest, Mekedaatu is a pristine nature retreat even if it is only for a few hours. The river Kaveri has formed a deep gorge so narrow that local legends believe that goats can easily leap across it as the name mekedaatu suggests. Through the journey from Bangalore to Mysore several pit stops like Magadi, Maddur, Channapatna and Ramanagara break the drive and offer scenic refuges to city weary travelers. Ramanagara gets its name from Ramagiri Hills or Ramadevara Betta. Along with Ramadevara Betta there are other hills Rama Siddeshwara betta, Shivar-amagiri, Kaakasura Betta, Kapotagiri, this hill resembles a lingam when viewed from the east, Ganesha from the west, a serpent from the north and Lord Hanuman from the south. The village has an Agrahara, on the banks of the river Arkavati. Arkeshwara Temple built in Vijayanagara style was later renovated by Krishnaraja Wodeyar III. One can see the small temple of Venugopalaswamy on the right and Prasanna Ambadevi shrine on the left. The annual Jatra held on Phalguna Shudda Poornima is very auspicious. Kharkhaane Bande: This hillock is about 3066 feet above sea level, 450 steps and three doorways that lead to the rock carvings of Venugopal, Ganapathi, Maruti and Garuda and many inscriptions. Rameshwara and Sri Rama Temples: Atop the hill is a pond, the Rameshwara shrine on the right and Parvathi temple nearby. Earlier this temple was called the Thryambakeshwar temple, a Kalyana Mantap was built by Kempegowda. The left side of the pond hosts the Sri Rama temple with Navaranga statues of Vaishnavite style. Saint Ramanujacharya and Nammalwars yogic postures are seen here. On the ceiling one can observe the Shree Chakra with serpents, the temple sanctum hosts Sri Rama, Sita, and Hanuman. The shikara (temple top) was built in Dravidian architecture. King Kempegowda constructed a Rangamantapa. It is believed that Kempegowda found treasure at the rock, Homiakumbhi Bande, which is behind the Sri Rama temple. This place is called the Naidile Theertha. These places were visited by the Saint Ramanujacharya. Adjoining the hill is the Yamaraja Betta. The nearest international airport is the Bengaluru International airport which has been recently renamed as the Kempegowda International airport. The Mysore Airport is a smaller airport with flights between Mysore and Bangalore and Chennai. The Mysore airport is also known as the Mandakalli airport. Ramanagara is located approximately 50 kilometers south west of Bangalore. The newly carved out district of Ramanagara is well connected to Bangalore and Mysore via the six lane expressway between the two cities. Government and private buses regularly ply tourists and locals between Ramanagara, Bangalore and Mysore. Taxis and rental cars are also readily available. Ramanagara is well connected to the rest of South India by the Railway network system. Just like the highway connection, the railways also connect Ramanagara to Bangalore and Mysore. Autos, taxis and buses are easily available from the railway station in Ramanagara. Ramanagara enjoys pleasant tropical weather throughout the year. The summer months between March and May tend to get uncomfortably warm especially with so many rocky and hilly areas around town. If rock climbing is the reason for your visit, winter might be the best time to visit. Monsoon might introduce you to leeches and slippery climbing conditions that can be treacherous. Go Rock Climbing In Ramanagara!